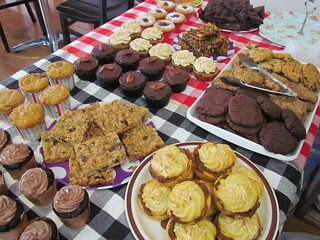 I organised another bake sale for Animal Liberation QLD on the 7th of May as part of the Worldwide Vegan Bake Sale. It happened a week after the official fortnight for the WWVBS due to public holidays, school holidays, work rosters and family events, but such is life. Once again, we held it at The Green Edge. 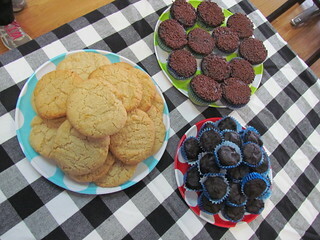 As usual, first here are the new things that I made for the bake sale. While I have a couple of tried and true favourites, I don't test everything before I make it for a bake sale. Live on the edge! There are too many recipes out there to try. Banana Bread French Toast Cupcakes from Bake and Destroy by Natalie Slater. 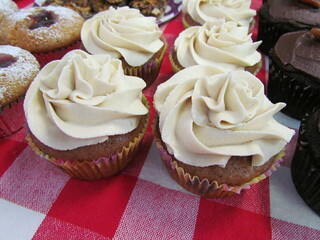 These banana bread cupcakes are topped with a maple buttercream frosting, which makes for a lovely combination. The frosting has the bonus of not being too sweet, and has a very rich maple flavour thanks to both maple syrup and maple extract. It also makes a good amount of frosting, I had about one cupcake worth of frosting left at the end, so if you just give an extra swirl with your frosting bag it should come out even for the twelve. 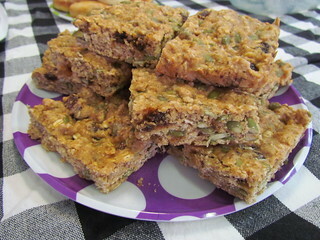 Pepita Oatmeal Raisin Cookie Bars from Oatrageous Oatmeals by Kathy Hester. I love oatmeal and raisin cookies, and these bars were just delicious. The pepita gives them a nice crunch as well. This recipe is baked in a 9x13 inch pan for 16 squares, though I cut them into 12 big squares for satisfying bake sale goodies. Though I confess I kept two, one for taste testing and another to cut and freeze for work day snacks. They freeze great! 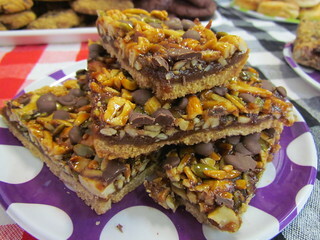 Caramel Nut Barley Squares from Wholegrain Vegan Baking by Celine Steen and Tamasin Noyes. These tasty squares have a baked barley base topped with a caramel nut micture (almonds, cashews, pepitas) and a final sprinkling of chocolate chips. Mine turned out a lot flatter than the photo in the book, even though I used the specified size pan (an 8x8 inch pan, I cut them into 8 slices for the bake sale), but they still looked pretty nifty and they tasted good. I was a little lazy and used raw slivered almonds (instead of dry roasted almonds) and unsalted pepitas (I added a little bit of extra salt to the caramel). I needed to bake my caramel for a few extra minutes in the oven to get it to set up. Peanut Butter Black Bean Brownie Bites from Naturally Lean by Allyson Kramer. These cute little bites are gluten free and have no flour at all, instead they are based on black beans, peanut butter and cocoa! The recipe says it makes 16 servings in mini muffin cups, so I pulled out my mini muffin/cupcake pan but I ended up with 28! So I guess her mini muffin cups are a bit bigger than mine! 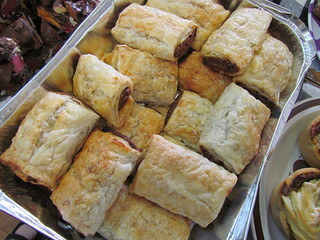 I reduced the baking time from 30 minutes to 25 minutes due to the smaller size. On a practical level, the batter was super sticky to get into the cups! I had to use wet hands and wash them a lot. But they were a nice, rich little morsel. Soft on the inside and crunchy on top. 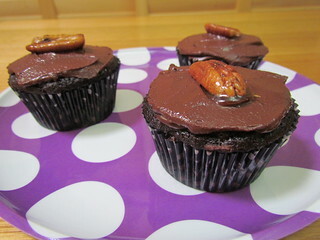 Spicy Chocolate Cupcakes with Hot Candied Pecans from The Superfun Times Vegan Holiday Cookbook by Isa Chandra Moskowitz. I'll save talking about these cupcakes for a future recipe round-up I am going to do from this book. They were part of a little self-challenge I am doing to cook one recipe for every holiday in the book. The bake sale was the 7th of May, so I made these from the Cinco de Mayo chapter. Stay tuned! 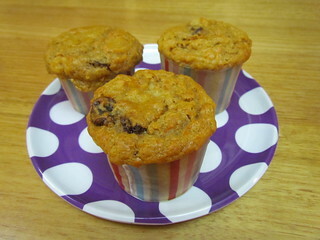 Carrot-Pineapple Sunshine Muffins from Veganomicon by Isa Chandra Moskowitz and Terry Hope Romero. OK, so I have made these before. But the last time I made them was so long ago that I wasn't taking any food photos. So I remade them. This was not a problem at all, as these are delicious! I used a mango-peach flavoured yoghurt in them this time, which gave a nice flavour. They have crushed pineapple, shredded carrots and raisins in them. 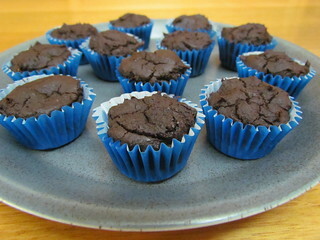 I was using some larger-sized muffin cups, so I made 7 rather than 12 this time. However, the cookbook says to fill them right to the top, as they don't rise much. This was a lie (or perhaps due to the larger volume), because they did rise and some of them dribbled down the side of the cups, so be cautious! 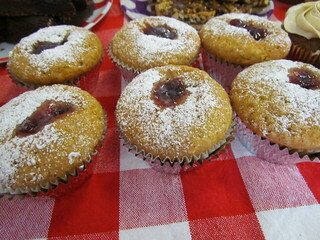 Jelly Doughnut Cupcakes from Veganomicon by Isa Chandra Moskowitz and Terry Hope Romero. 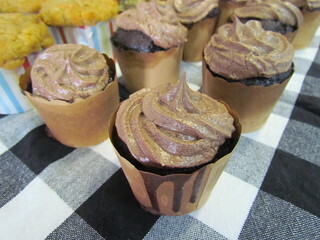 Another remake to get a photo of, these cupcakes are delicious and taste so much like doughnuts! I used a plum jam in them, which was lovely. You drop the jam on top of the batter and they are meant to rise and cover the jam all on their own, but you can see that a lot of mine did not (perhaps be a bit less generous with the jam?). But I think they still looked cute. I did have to top them up with a bit more jam before serving to get it right up level with the top of the cupcake. Triple Chocolate Gluten Freedom Cupcakes from Vegan Cupcakes Take Over The World by Isa Chandra Moskowitz and Terry Hope Romero. I make a variation on the GF chocolate cupcakes from this book every bake sale. This time I went simple. Chocolate cupcakes topped with the Oh-So-Rich Chocolate Glaze from Naturally Lean by Allyson Kramer, and pressed into some chocolate sprinkles. Lemon Olive Oil Cookies. 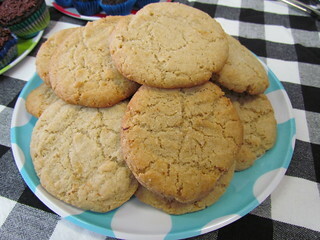 I've made these GF cookies several times before as well, the recipe can be found on Allyson Kramer's blog here. They are so lemony and yummy. Here is what other people made! 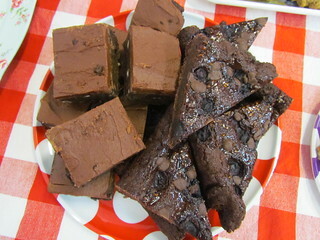 Chili Chocolate Slice. 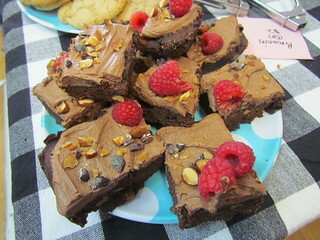 As well as my final contribution, the famous Berry Patch Brownies from Let Them Eat Vegan by Dreena Burton. 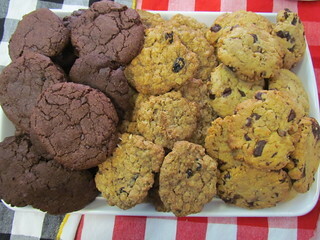 Double Chocolate cookies, Oatmeal Raisin cookies, Peanut Butter Chocolate Chip cookies. 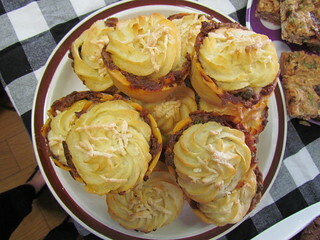 Cottage Pies. These were ace! Rocky road. This was pretty amazing. 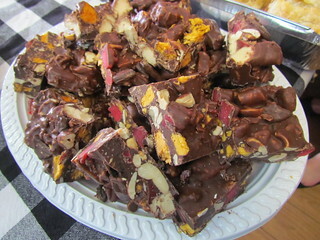 It had honeycomb, biscuits, nuts and jellies in it. Now for some table shots! 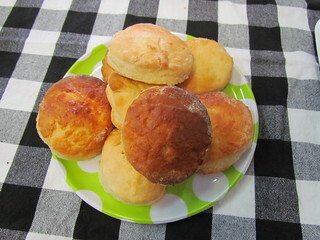 There were also some jam drops and some fancy baked doughnuts that I didn't get photos of. It was a bit slow at times, but we raised just over $700 for ALQ to use towards their campaigns. The next one will be in a couple of months, and I already have a list of new things I would like to make for it. 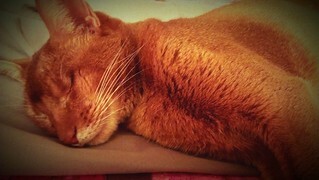 Yesterday was three months without Sahara. I miss her so much. Every single thing looks amazing! I was kind of getting into baking, but stopped once I went gluten free. But I see a lot of delicious gluten free items, I see that it is possible! $700.00 dollars is amazing, congratulations! I still can't believe it's been over a year since i lost Dylan. I think about him everyday. Hugs. I always make a few GF options because I want everyone to be able to enjoy the bake sale. Yay for WWVBS! Part of me misses when we used to hold one here every year, but I don't miss being the organizer. Ha. I wish someone else would organize one, and I could just contribute some baked goods. 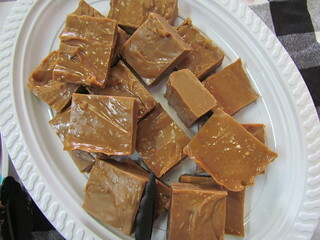 :-) That peanut butter fudge would all be in my belly. ALL OF IT. So sorry about Sahara. It's so just hard. I'm coming up on the one-year anniversary of losing Datsun, and I'm feeling it. 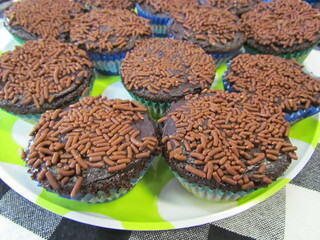 I definitely enjoy when I can contribute to other bake sales as a non-organiser. Just have to make one or two things and can drop off and run, so much less stressful! I love reading your bakesale posts and this one is very timely. I'm doing a mini bakesale next Saturday at a music event we are putting on so you have given me some good ideas. I am most definitely trying out those donut cupcakes. I hope your bake sale goes well!! WOW! Looks like you made so many treats! You are quite the baker. And it sounds like you guys raised a lot of funds - that's awesome!! Everything looks SO GOOD! Wish I could be there for one of these sometime. I love your bake sale posts. XD So many goods. I just imagine you in the kitchen baking all day and only eating sweets- you know to make sure they turn out okay.